It is more than often that we want to see how well a certain learner is doing, and it has never been easier. The Average Result value shows the average result for all courses completed by the learner. For example, suppose that a learner is assigned completed three courses. They get a 100% result in the first, 50% in the second, and do not start the third course at all. The Average Result in this scenario will be (100% + 50%) / 2, that is, 75%. The course the learner does not start does not affect the Average Result. 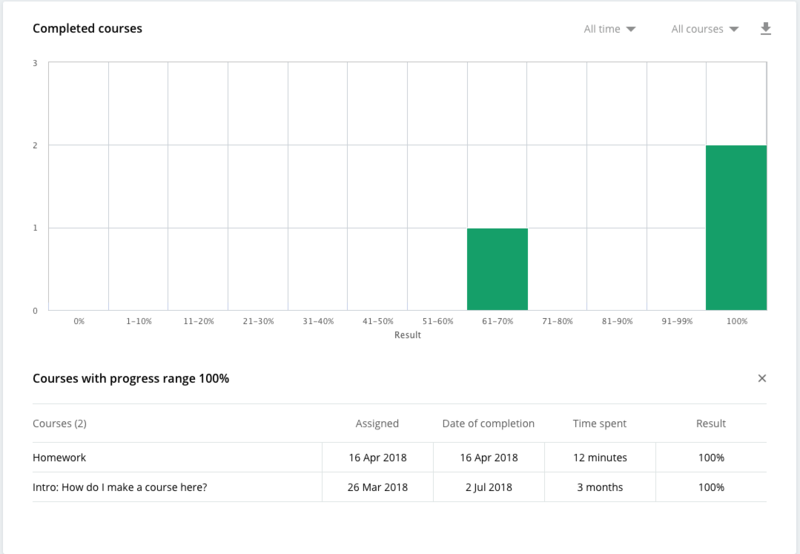 The Assigned courses, Completed courses, and Courses in progress values help you track how many courses in total were assigned to this learner, and how many of those the learner has completed or started. Shows you the list of courses that were assigned to the learner but have not been started so far. Gives you the list of courses that the learner has started, but has not yet completed. This graph helps you understand how well the learner is doing in terms of results. For every course they have completed, the result is added to the graph in the corresponding band (0%, 0-10%, 10-20%, etc). Click one of the bars to see the list of all the courses results of which fall within the band along with the exact result for every course. The sections show results of the learner per each of the assessments that they completed while taking the courses, if you want to learn more about the way the assessments work, read this article. Every question in a test can be assigned one or more tags. For every tag included in every course the learner has started, this section displays the percentage of questions with this tag that were answered correctly. To learn more about the tags, please refer here. The section shows the user's achievements reached while taking the courses, this article here will give you an idea what the competencies and achievements are, and how they can serve your project. and each section of the report is downloadable.